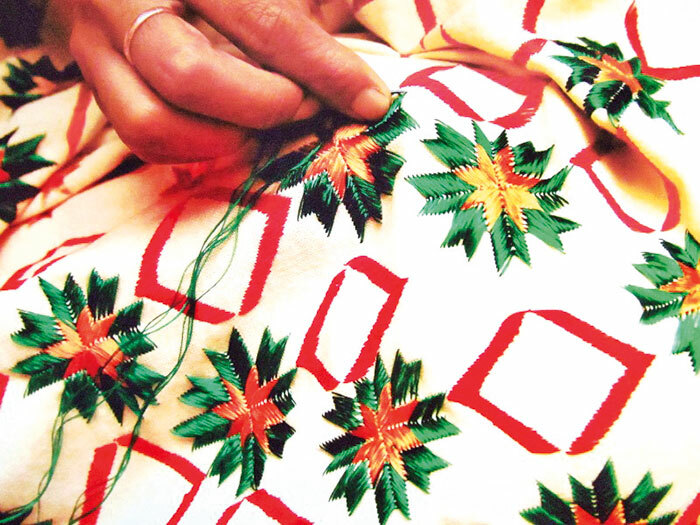 Bright, colourful and attractive, this ‘flower work’, is credited to women of rural Punjab, and is found on items of clothing and decoration. During its early years, phulkari was done on thick cotton called khaddar, and its colours symbolised who it was meant for — white was used by old women or widows, red was seen on young girls and brides-to-be, and blue and black were meant for daily use. Designs of plants, animals, jewellery and geometrical shapes were common. If you’re a fan of Bollywood, you’d have seen many Yash Raj heroines wearing phulkari dupattas. It’s has even made its way onto fashion ramps, with designers using it for saris and kurtas. You’ll probably spot someone wearing a phulkari shawl or outfit at the latest do or during winters.